Researchers at the University of Antwerp in Belgium have created a new supercomputer with standard gaming hardware. 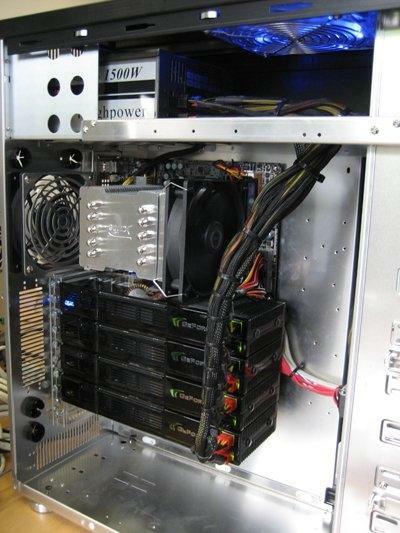 The system uses four NVIDIA GeForce 9800 GX2 graphics cards, it costs less than 4000EUR to build and thanks to NVIDIA’s CUDA technology it delivers roughly the same performance as a supercomputer cluster consisting of hundreds of PCs! The guys explain the eight NVIDIA GPUs deliver the same performance as more than 300 Intel Core 2 Duo 2.4GHz processors. Another interesting note is that this system doesn’t need SLI, their application uses the NVIDIA CUDA programming model which makes all eight GPUs work in parallel.